Go here for more about Franklin Delano Roosevelt. Go here for more about Franklin D. Roosevelt's Day of Infamy Speech. Go here for more about the Pearl Harbor Attack. It follows the full text transcript of Franklin D. Roosevelt's Day of Infamy speech, delivered to Congress, Washington D.C. - December 8, 1941. The United States was at peace with that nation, and, at the solicitation of Japan, was still in conversation with its government and its emperor looking toward the maintenance of peace in the Pacific. Indeed, one hour after Japanese air squadrons had commenced bombing in Oahu, the Japanese ambassador to the United States and his colleague delivered to the secretary of state a formal reply to a recent American message. While this reply stated that it seemed useless to continue the existing diplomatic negotiations, it contained no threat or hint of war or armed attack. The attack yesterday on the Hawaiian Islands has caused severe damage to American naval and military forces. Very many American lives have been lost. In addition, American ships have been reported torpedoed on the high seas between San Francisco and Honolulu. This morning the Japanese attacked Midway Island. Japan has, therefore, undertaken a surprise offensive extending throughout the Pacific area. The facts of yesterday speak for themselves. The people of the United States have already formed their opinions and well understand the implications to the very life and safety of our nation. Always will we remember the character of the onslaught against us. No matter how long it may take us to overcome this premeditated invasion, the American people, in their righteous might, will win through to absolute victory. I believe I interpret the will of the Congress and of the people when I assert that we will not only defend ourselves to the uttermost but will make very certain that this form of treachery shall never endanger us again. With confidence in our armed forces--with the unbounded determination of our people--we will gain the inevitable triumph--so help us God. 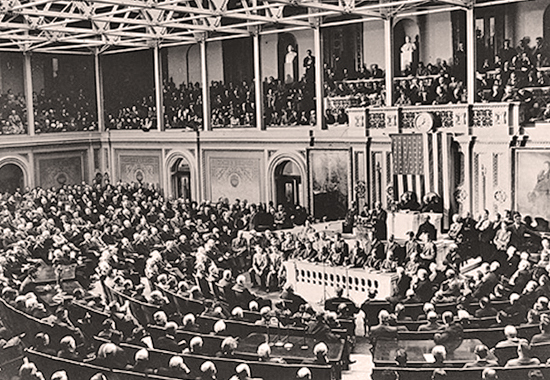 I ask that the Congress declare that since the unprovoked and dastardly attack by Japan on Sunday, December 7, a state of war has existed between the United States and the Japanese Empire.